Another day, another product getting all patriotic and declaring its love for the Union Jack. This one from Vaseline is really rather cute though. 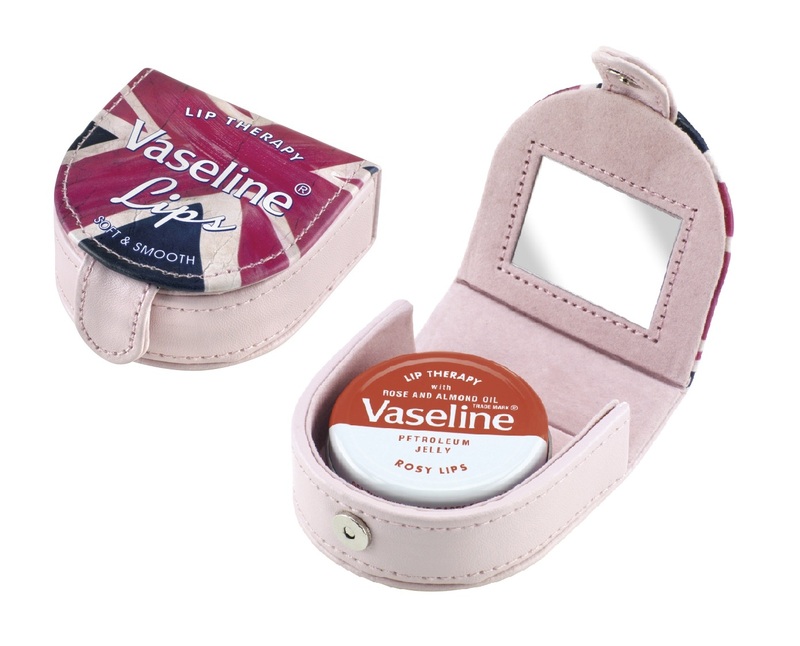 The limited edition Vaseline pot holder is fit for a Queen, giving you a perfect keepsake to remember the year 2012 by. It contains a faux pink leather interior and a handy little mirror, so you can keep your lips looking kissably smooth all Jubilee bank holiday long. For £3.99 you get the pouch, plus a little tin of Rosy Lips so you’re looking very much the English Rose. It’s available exclusively in Superdrug and Sainsburys, but I’ve got three to give away to you lovely lot in celebration of the impending four-day weekend. All you have to do to win one of these is to tell me the thing you love about Britain the most. Is it how we always bring out the Pimms, rock uncoordinated sock and sandal looks, burn like tomatoes or pull together when the football is on? Tell me all about it. Make sure you’re a follower of this blog and leave your answer, along with an email/twitter handle for me to get hold of you, and we’ll get your lips smoochable in no time. Good luck!T&Cs One entry per person; must be a follower of this blog via GFC and leave valid contact details; open to UK residents only; winners selected at random after closing date of 11.59pm 30th May 2012; no alternative prize available; LBQ isn’t responsible for delivery of prize. Not a UK resident, so I can't apply, but really – I just wanted to tell you what I like most about Britain – it's the way you keep traditions open to the new age :)And besides – I really love this little pouch,it's sooo cute :)Have a great weekend! Wow, these are absolutely gorgeous. The thing I like about Britain the most is how as soon as we get the first glimpse of sun everybody strips off down to shorts and vests, not always a pleasant sight!! And as soon as the sun comes out there is a hose pipe ban!!! I never do these, but this is adorable! My favourite thing about Britain is our historical houses. Lovely stately homes or small 17th century cottages, you can feel the swoosh of ball gowns or scurry of doomed priests in the fabric of them. So British.